At last the final piccys. At least ive had fun with this build. Cheers J[img]http://i73. [url=https://servimg.com/image_preview.php?i=123&u=17359276] servimg. com/u/f73/17 /35/92/76/210.jpg[/img][/url]ohn . w .
You know, I like it. I just had a conversation with my son about enjoying the hobby your own way. If you go down the realistic route, there will always be those that want to count the rivets or tell you that something is off by a millimeter. What you have made, although different, is wonderful because one it is different and two you built a wonderful sub. Cheers! There is room for all in this hobby, the rivet counters and those who paint there boats a different scheme, one of the most well known sub guys in Norwich, painted a bright yellow sub, grey and it looked so much better. I have a photo of a 212 in Germany painted blue and grey, with a Russian star on the front of the con tower. so what, its his money. I agree. It is a hobby so it should be fun! The model boat hobby is rather dominated by scale purists (or rivet counters!) in my opinion. 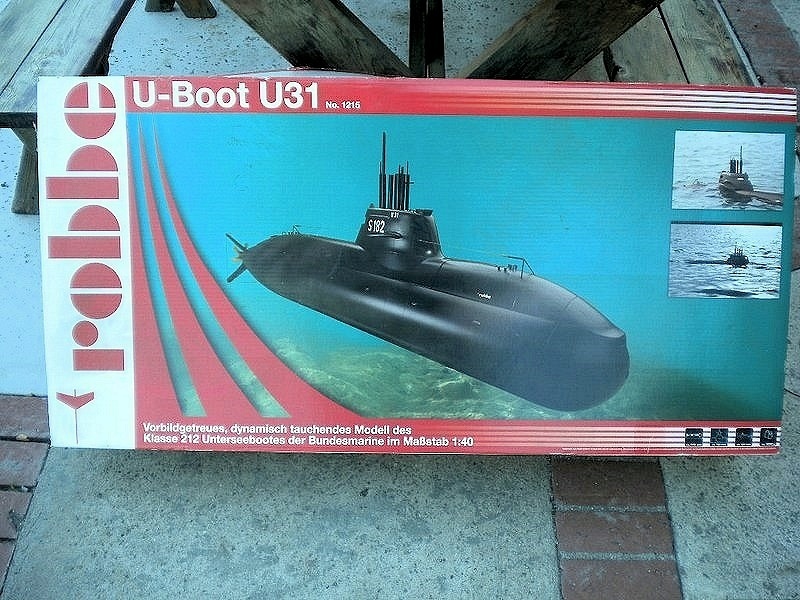 For submarines, if you have built it yourself and it works well, reliably and often then you are a rare breed anyway. John, I'm not criticising your boat at all, please don't think that...you've done a damn good of building it and you have every right to be pleased with it. As David said, it's your boat...if you've built it and it works, and you're pleased with it, then you have achieved more than a lot of would be sub modellers have. We need to see some pictures of it in the water now..always a nerve wracking time when a newly built sub goes in the water for the first time. Good luck for a successful first mission! Talking about engineering etc, I have not long returned from the model engineering exhibition at the ally pally, London. My first time there and although a very long day, a very good one , no matter what you are into there was a feast of things to gawp at and all very interesting. As I used to do model helicopters, I have only just moved into boats. but the amount of r/c stuff there was fantastic. There is a guy on mayhem, whose moto is "I don't build them to look pretty, I build them to play with". 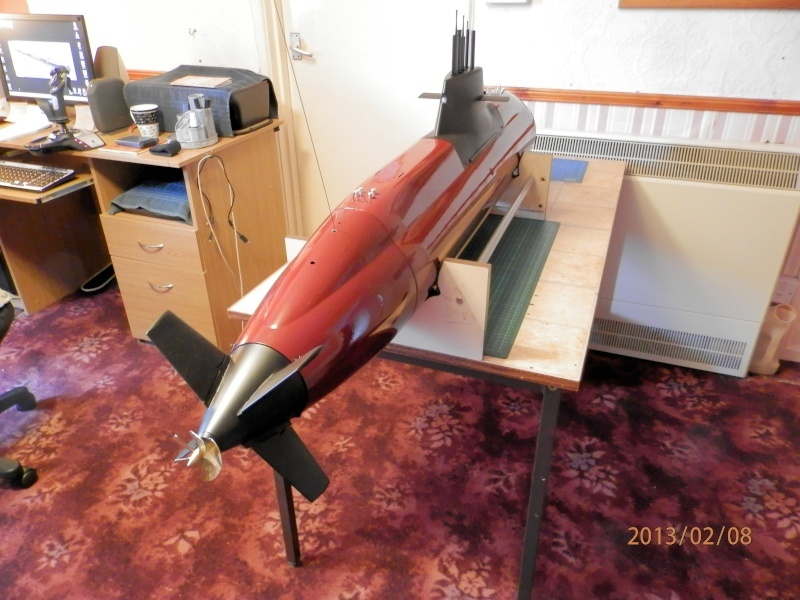 Well done john you have done a lovely job of your sub if you like it red why not. that night I went home and designed my own version did not have any photos or anything but anyway built it and worked well went under water and came back only problem I made it out of balsa wood so I made mk 2 out of plywood this time perfect and so easy to build you could build the basic hull with a band saw in 2 evenings and I have still got it it’s my profile picture and in my gallery. Its only now that I have got back to doing subs I can’t build any more planes got 18 of the things. It keeps us off of the streets and stops us mugging little old ladies. all power to the wood and glue. I used to make balsa warships on the kitchen table, for my probation officer !!. as you say john we have dabbled in al sorts of modelling things. i do have a soft spot for model boats as this is were my rc hobby started with my dad and two school mates and still got my boats all 7 of them then the love affair of aircraft came in and still flying 25 years later. whats your next sub project? That's one thing I've never done, model railways. I did thinkg about building one once, but that was as far it got. 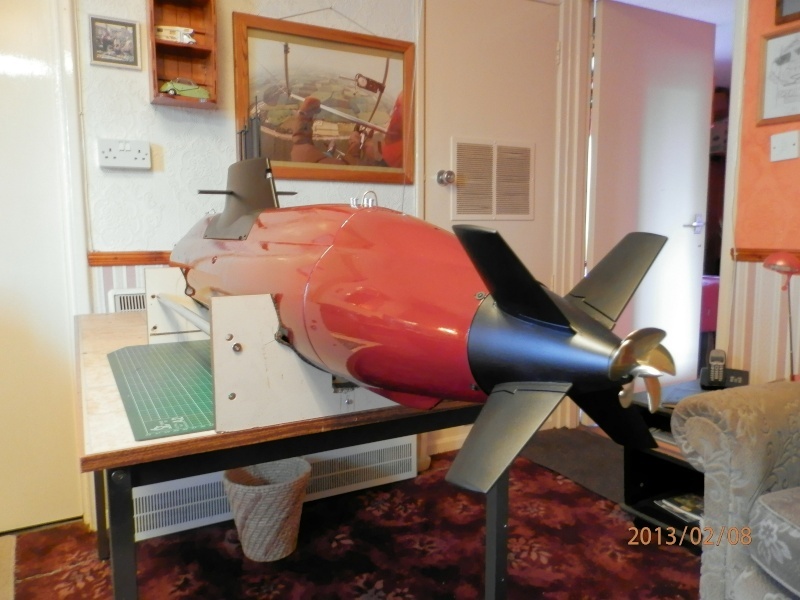 Boats, and mainly submarines, have been my main section of the hobby for well over forty five years now, with a deviation into r/c stock cars for a while back in the '80s for a year or so, but then the lure of the submarines called me back. And here I still am..
nice to have a change. I would like to make a submarine out of a model manta ray. or shark, but finding one large enough is proving difficult. That's why I took a course of lessons to learn how to fly a heli, Geoff...fixed wing totally confused me, but helis seemed to be easy to keep in the air. My tutor was a local expert, he could do things with a helicopter that you wouldn't have thought possible, he also held a full size heli licence and built and flew an autogyro for relaxation. As far as I know he still has the autogyro, it's been a while since I saw him. Pic below is my second Chinook, this one was on 35mHz. It developed all sorts of electronic hiccups, so in the end the shop from where I bought it from replaced it for a new one on 2.4gHz. flying officer kite, reporting sir!! It would seem that most of us have also "commited aviation", at sometime. I spent 9 yrs in the r.a.f. as a fireman,(sgt). and since then have flown hang gliders microlights and paragliders, only giving it up at the age of 70. I was getting too much of a fair weather flyer. It was then I took to mugging little old ladies for something to do. Untill one of them beat the S*** out of me, and I retired. ONLY JOKING!! John...I worry about you sometimes, I really do! 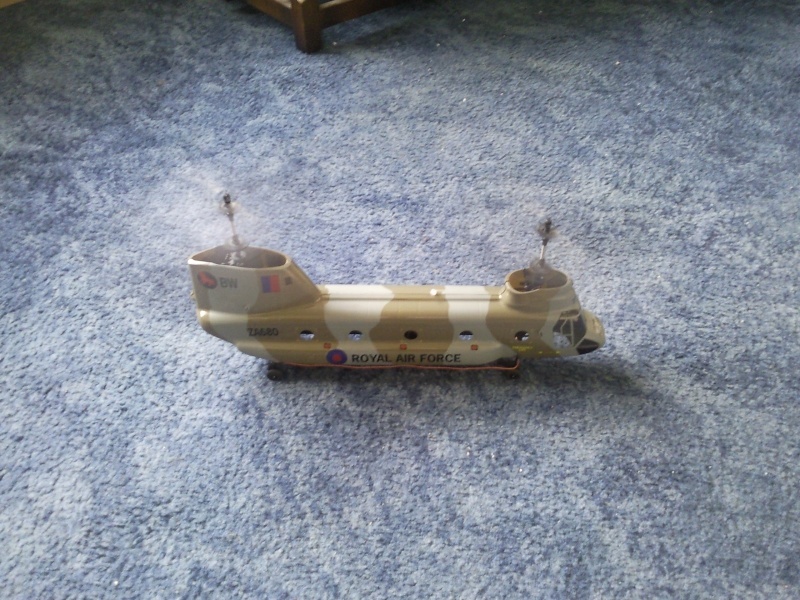 we had a few chinooks in my flying club great models. i can fly the smaller 4 channel helis no problem they just bounce of the walls floor then you just pick them up and go fly again its when i get my 450 sized ones out it goes wrong they dont bounce and things are spinning around much faster and when they hit the floor its messy and expensive. The Chinooks are great fun to fly, I used to take mine outdoors on a calm evening, park it behind the wheelie bin compound. then when next door's cat put in an appearance, I'd carry out a low level attack on it with the lights blazing. I don't know what the head speed of a Chinook is, but when I reversed it into myself they were rotating plenty fast enough! If you had worked in a mac million ward, and a mortuary, you to would have a black sense of humour !! For someone ho:[quote="...have only just moved into boats....". [/quote],You did a hell of a job. For me is SUPER GREAT,and if you enjoy it about how was don is Perfect. No matter what You choose to do next,keep us on post!. John, I was a trucker for over forty years, and the last sixteen of those years I was a council trucker...believe me, you need a sense of humour to work for a council! Did I not mention the 10 yrs I drove school busses for dorset county council ? How silly of me. it ended up in 5yrs of clinical derpresion. But i am all right now. that's why I build subs. and yes ive had a hell of a lot of jobs. I can top that I've been married for twenty years. And now you can do what you want, when you want and leave stuff where you want! Not to mention burning as much 'midnight oil' as you want to get the 'just a bit more' done to the model on those evenings when everything goes so smoothly that it's too good to last !! Me, I'm really lucky that I can be 'im in 't'shed for as much as I like, except there's no waitress service to the shed in winter. [quote]I don't know what the head speed of a Chinook is, but when I reversed it into myself they were rotating plenty fast enough! richard thats not a great idea thats what worrys me at least a submarine can't jump out and bit you a fish might if you have to rescue a sunken sub mind you.